This Chatham House Paper examines the nature of Soviet relations with Syria, assessing the commitments made and the gains reaped by Moscow and Damascus in the economic, military and political spheres. After discussing Soviet interests in the region in general and with regard to Syria in particular, the author traces the evolution of the relationship between Moscow and its major Middle Eastern ally since Asad came to power in 1970. 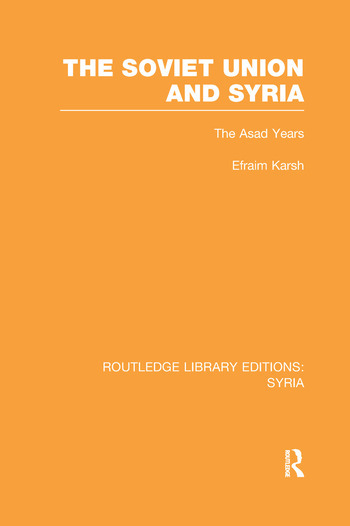 While the study argues that huge Soviet military aid has intensified the pro-Soviet alignment of Syrian policy, it contends that Asad’s perception of his country’s national interests has also played a large part in shaping the relationship. The author concludes that both sides have gained from what is an interdependent relationship. If Damascus remains almost wholly dependent on Soviet military aid, regional constraints give Syria some leverage over Moscow. Without Moscow’s support Syria might perhaps not have played such a leading role in the region; without Damascus the Soviet Union might have found itself on the sidelines of the Arab-Israeli conflict.